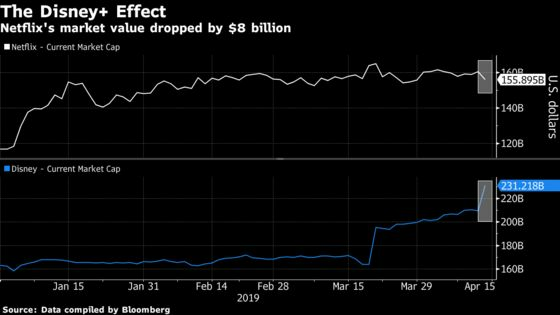 (Bloomberg) -- Netflix Inc. lost as much as $8 billion in market capitalization in a few minutes of trading on Walt Disney Co.’s news of its upcoming -- and cheaper -- rival streaming service. The entertainment giant presented Disney+ on a sound stage used to make the original “Mary Poppins,” delivering an Apple-style presentation of the online product. The service will live or die based on its content -- and that’s where Disney made a big statement. Disney+ will feature an arsenal of kid-friendly programming, including 13 classic animated movies, 21 Pixar features, original series, and material from its Marvel and Star Wars franchises.